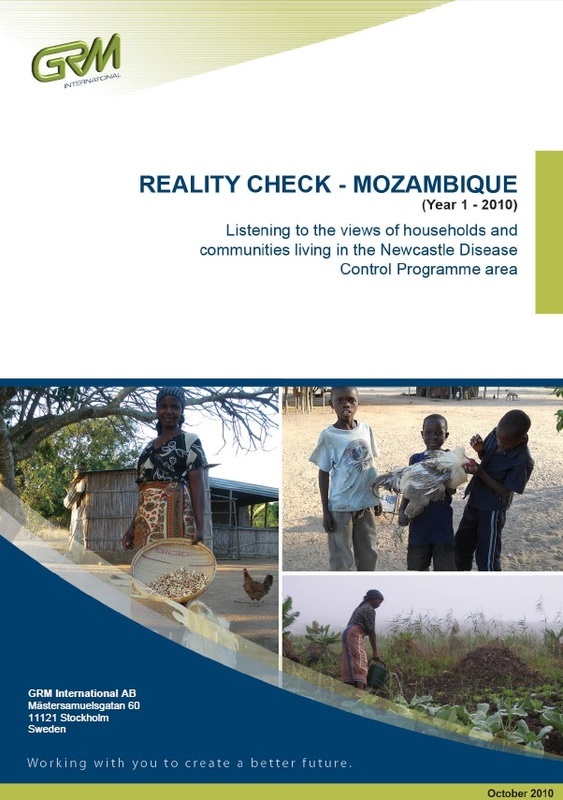 This study undertaken by GRM International on behalf of the Kyeema foundation was intended to provide information on how the EC’s investment in Newcastle Disease Prevention and poultry husbandry in Gaza Mozambique was being translated into the experienced reality of people living in poverty in the project areas. The main aim of the (EC) Food Facility Sub Grant component implemented by KYEEMA Foundation was to contribute to food security and poverty alleviation through the improvement of poultry husbandry practices and the control of Newcastle Disease (ND) in village chickens. Through the Reality Check the project aimed to enhance its understanding of the relevance and importance of poultry rearing to livelihood strategies and the impact of external program of support. Chicken use: findings suggest that for most HHH Chickens were not considered part of a livelihood strategy nor were considered a staple food source, neither the meat nor the eggs. For many of the households they were instead considered as easily liquefied assets (at the ‘farm gate’) and as gifts to honor guests. The significance of chickens as a liquefiable asset was noted to increase within those homes where households were comprised of the elderly and young (due to death or migration) and there were broader indications that for many of these ultra-poor households they existed in a largely ‘cash-less’ environment in which chickens imagined as ‘current accounts’. Husbandry practices: whilst chickens were generally recognized to be important as ‘cash’, there value was often perceived to be in the ease with which they could be kept and there was a noted reluctance to provide overnight housing for poultry (due to predator attraction). Chicken welfare when it did occur tended to be the domain of women and younger children. Newcastle Disease: There was a general familiarity with the disease, its timing and symptoms. Vaccination however had a number of issues surrounding it. These include translation issues over the method of application (the Xi-Changana word for vaccination means ‘a prick’ and the ND vaccine is an eye drop), lack of understanding of the distinction between preventative measures and cures and in parts a general negative perception towards the vaccine; that it may kill chickens or is unnecessary if a family only has a small flock. These issues have led to limited uptake for the vaccine and vaccinators appeared de-motivated.